The Diver is a Series 8 Minifigures minifigure released in 2012. The Diver's feet are taller than usual because of two 1X1 "weight" bricks attached to his feet. His bio mentions the Pirate Captain and the Ocean King. The Diver has printing on his back, the only minifigure in Series 8 having so. 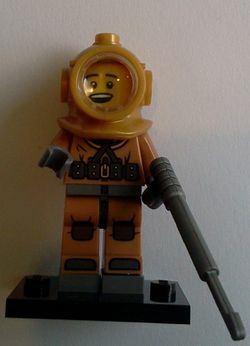 The Diver's visor is the same as the one used in the LEGO magnifying glass and magnifies his face. He is similar to the Diver from the box art of 3851 Atlantis Treasure. If he could, the Diver would spend his entire life beneath the sea. He’s a born explorer, but instead of climbing mountains or looking for lost valleys, he’s dedicated his life to plumbing the ocean depths in search of new discoveries and the answers to old mysteries. Thanks to his weighted belt and boots, he can spend countless hours wandering through deep-sea trenches (as long as someone up top keeps pumping air into his diving hose) or hunting for shipwrecks (which aren’t hard to find when the Pirate Captain is around). He isn’t afraid of sharks or giant squids. Even the grumpy Ocean King considers him a friend, and has been known to ask the Diver to take care of his pet catfish when he goes out of town. To the Diver, the deep blue sea is the real final frontier! This page was last edited on 11 July 2016, at 23:42.